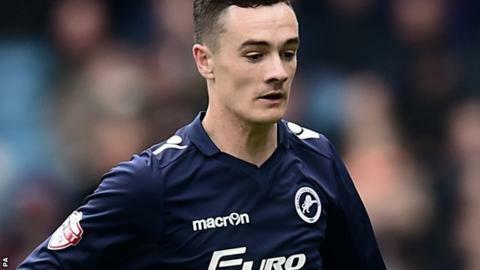 Shaun Williams scored the only goal as Millwall beat Bury to continue their League One promotion push. The visitors were denied in the second minute when Jordan Archer somehow clawed out a Peter Clarke header. Daniel Bachmann did well to keep Fred Onyedinma and Lee Gregory from scoring for the Lions, but he could do little about Williams' rasping 25-yard strike. Archer kept out Danny Pugh's half-volley late on as Millwall held out to move up to seventh place in the table. "First half was outstanding and I really enjoyed watching them. We just got better and better. "Second half we were on the back foot a little bit and didn't hit the same standards, but we ground it out and that was a really pleasing victory. "I'd be tempted to say that was our best of the season because it was an important one after defeat on Tuesday night at Fleetwood." "Sometimes you deserve what you get and I think if there's a honestly in this performance, a draw would have been a fair result. "First half we didn't look right, the game plan certainly was to work the ball through midfield and get a real foothold in the game, through our midfielders and fullbacks and grow the team up the pitch. It didn't happen. We tried Danny Mayor centrally but it never worked. "In the second half, it was completely one-sided and unbalanced, we drove the team forward. The players took it on. They played with a no fear approach that they didn't have in the first half. The second half, it was no holds-barred approach and we created chances and had impetus. We've got to assess on the way home why we've lost this game today." Match ends, Millwall 1, Bury 0. Second Half ends, Millwall 1, Bury 0. Attempt saved. Steve Morison (Millwall) right footed shot from outside the box is saved in the bottom left corner. Mark Beevers (Millwall) wins a free kick on the right wing. Attempt missed. Peter Clarke (Bury) right footed shot from the centre of the box is too high. Corner, Bury. Conceded by Ben Thompson. Substitution, Millwall. Noah Chesmain replaces Shane Ferguson. Substitution, Millwall. Ben Thompson replaces Ed Upson. Corner, Bury. Conceded by Shaun Cummings. George Saville (Millwall) is shown the yellow card. Foul by George Saville (Millwall). Byron Webster (Millwall) is shown the yellow card for a bad foul. (Bury) wins a free kick in the attacking half. Foul by Byron Webster (Millwall). Nathan Cameron (Bury) is shown the yellow card for a bad foul. Foul by Nathan Cameron (Bury). Aiden O'Brien (Millwall) wins a free kick in the defensive half. Attempt saved. Danny Pugh (Bury) right footed shot from outside the box is saved in the centre of the goal. Substitution, Bury. Danny Pugh replaces Joe Dodoo. Substitution, Bury. Tom Pope replaces Joe Riley because of an injury. (Bury) wins a free kick in the defensive half. Corner, Bury. Conceded by Shane Ferguson. Substitution, Millwall. Steve Morison replaces Fred Onyedinma. Shane Ferguson (Millwall) wins a free kick in the attacking half. Foul by Joe Dodoo (Bury). Danny Rose (Bury) wins a free kick in the attacking half. Mark Beevers (Millwall) wins a free kick in the attacking half.